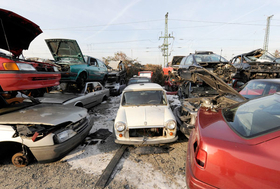 TURIN -- The Italian Ministry Council today approved an economic stimulus package that includes an auto scrapping incentive of up to 3,000 euros. The offer starts today and will run until the end of the year. Similar offers in Germany and France have helped revive dormant sales of new cars in those countries. According to Italian media reports, a car buyer will receive 1,500 euros if he scraps a car that is at least 10 years old and replaces it with a new car that meets Euro 4 or Euro 5 emission standards. Customers who exchange their old cars for ones that are powered by compressed natural gas, liquid petroleum gas or hydrogen get 3,000 euros. In addition, car buyers can get 1,500 euros for purchasing any new car with a CNG, LPG or hydrogen powertrain. France and Germany already have started offering incentives to car buyers to replace their old cars with new, more fuel-efficient models. In Germany, people who scrap cars that are at least nine years old and then buy new, low-CO2 vehicles receive certificates worth 2,500 euros. In France, the government is giving a bonus of 1,000 euros to people who replace their 10-year-old cars will more fuel-efficient models.